Imaginary Sunshine » Buying cardigans in the summer? Buying cardigans in the summer? I went shopping today. Can you tell? Of course, I’m not about to go and take and photo of what I bought at La Senza (we went because D needed to buy a gift for a friend’s bridal shower. 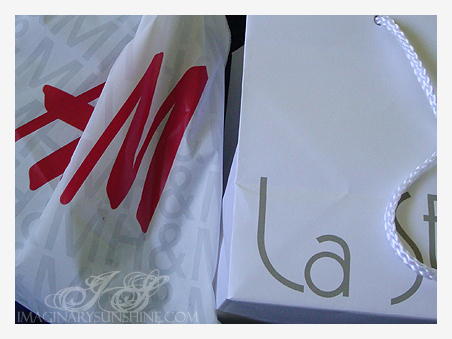 J and I tagged along and each bought stuff while D was busily deciding between two very similar looking silk garments). We also went to the library today – I borrowed a few smutty romances and a few beading books for inspirational uses. We also went to the crafts store where my sister J proceeded to spend exactly one ball of yarn as it was the exact brand, colour and weight that she was missing to complete her current project. I couldn’t resist when I saw this at H&M. 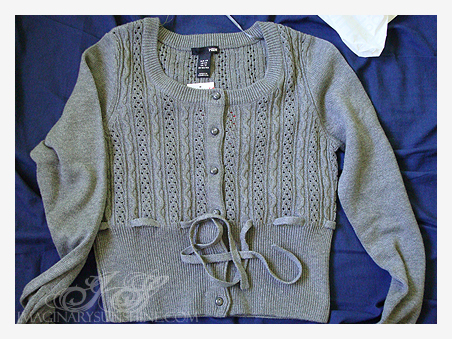 It was also in the sale section (well, considering it’s a cardigan and it’s the summer season, I don’t blame them). It was quite a bit off of the original price, so I’m pleased. Plus, I think it’ll get a lot of wear when the cooler weather hits in the fall. 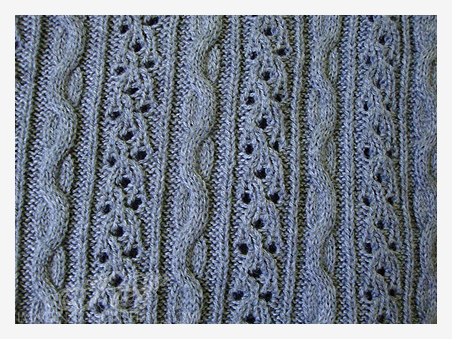 And it has an interesting cable pattern, which you can see in the photo below. My sister’s trying to find it (not the simple cables, but the ones with the holes) so she can see if she can reproduce it. Me, I’m just happy with it the way it is (and I didn’t even have to make it either!). Anyways, in other news… I have a new password protected post (I’m pointing below this entry!). It is a new password, so if you’d like access to it, please mention so here or via Twitter and I’ll either email it to you or send you a direct message via Twitter. And have you ‘claimed’ your vanity url with Facebook yet? I did it yesterday. Unfortunately, I forgot what time they were available to be claimed, so I wasn’t able to get just ‘michelle’ or even just ‘michelle.lastname here’. Which was rather disappointing. Facebook gave me a list of suggestions that included numbers in the url. It’s a bit early in the game to be suggesting that everyone throw in numbers, isn’t it? Considering that’s what people are trying to get away from. So, what did you do this lovely Saturday? Go shopping? Hung out with your friends? Spent a few hours reading fmylife.com? Shopping is so much fun:) I love that cardigan. It’s so pretty!